Get Professional and eye attractive website for your personal or business. 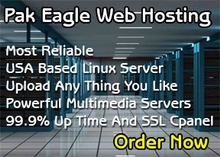 Pak Eagle has been designing websites since 2001 and has developed hundreds of multi-national companies websites. T he idea or development is not just enough for a success, but it need some good presentation for its completeness. we provide website design with unique colors, high, light, contracts, and other designs that are always unique one and creative. Many web development companies offers for web design, but much of customer have no knowledge of computer and its web development technologies. these companies use ready made templates and design that are free available on internet, just edit them and present to customer. but its against of copyright and have no uniqueness of design and user attraction. So Pak Eagle takes all these things in mind while designing the websites, its fast opening, its colors effects on visitor, High contracts, adobe design, its size, its matching with other website and all designing handling. you can get full trust on website designing project and give full customer satisfaction. we provide website designing on customer order, not on our choice. If customer need a website with light or dark colors, then we tell its advantages and disadvantages in advance. a if customer put choice on Pak Eagle to design and develop its website, then we can use all features to give more improvement to website.